The European Tour’s flagship event is held at Wentworth Club, Surrey, annually. If you have any interest in golf, you probably knew that. These days, however, it’s not just a golf event. There’s tonnes going on and that’s why GQ thinks it should be at the top of your summer sporting calendar. The best golf event in Europe? The Ryder Cup is amazing, no one is disputing that. But, it’s in France, and getting hold of tickets and accommodation at this stage is as likely as a Patrick Reed winning a best bloke ever competition. Ie, it won’t happen. The Open has oodles of charm and history to match, but as a sports connoisseur, you don’t travel 200-plus miles to watch world-class golf. 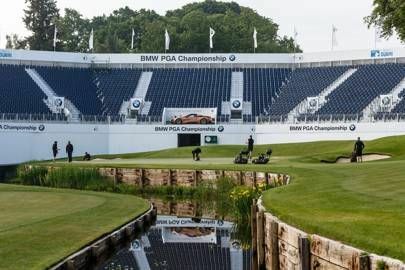 And as a sporting setting under the sun, Wentworth is as glorious as anywhere in the world – let alone anywhere within 20 miles of central London. Before last year’s event, Wentworth club unveiled a £7 million redevelopment of the jewel in its crown; the West Course. The questionable rejigs of the noughties are a distant memory with the course returning to its former glory with all 18 greens reseeded and nine remodelled. The course is the first in England to benefit from Sub Air technology under every green which allows the grounds team to control moisture levels, regardless of the weather conditions. They’re now among the best in the world – just ask the players. The facility in its entirety now oozes class throughout following new owners Reignwood Group’s commitment to spending over £20m on facilities over the past four years.